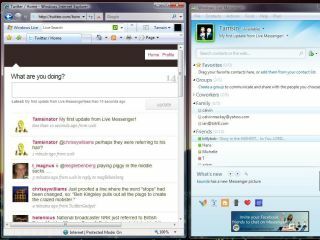 Our colleagues over on Windows Vista: The Official Magazine know a thing or two about Windows Live Messenger, and they've put together a list of 10 things you didn't know Windows Live Messenger could do. As well as chatting over Messenger, you can also use it to share photos, chat from your Xbox, post to Twitter and much more. Here are our five favourite Messenger tips from the list of 10 by Windows Vista Magazine. To set this up, turn on your Xbox 360 – without a disc in the tray – go to Xbox LIVE, and select Chat and IM > Messenger > Continue > Sign up for Messenger > Continue. Your Windows Live ID field will automatically fill in – you only need to add your password and you're done. Now you can merge your Live Messenger contacts with your Xbox LIVE contacts and carry on chatting while you watch films or play games. Don't worry about logging in to Twitter to send your update, just whip up your daily updates in Live Messenger. First off you'll need the latest version of Live Messenger, Messenger Plus! Live and Twitter Psm Pusher. Once you've downloaded and configured these, open any chat window and type /twitterconfig, then enter your Twitter user name and password in the pop-up window and click OK. Enter a personal message into the box below your name and press Enter to send a tweet. Any addiction to Live Messenger has to be taken seriously, and the recently released Windows Live Messenger Web Toolkit does just that. It comes with a range of tools for customising Messenger, but most important, it comes with the Messenger Web Bar. So if you're using someone else's PC or are not allowed to download new programs, then use this instead. Thanks to this you can start chatting directly from a web page without having to open a new window. As long as you have a web browser and an internet connection, you will now be connected to Windows Live Messenger. One word of warning, though: it requires that you register your website with Microsoft and you may have to work with some code to adapt the application to fit your site. There are good tutorials at the link above to help, but this isn't for the faint-hearted. To chat live on Facebook with Windows Live Messenger log in to your Facebook account, and in the top right-hand corner, type Facebook Live Messenger into the Search bar. This will take you to the results page. The Messenger application is the first one listed under the Applications tab. Select Go to Application > Allow and then sign in with your Windows Live ID. You can use some of the other Live Messenger applications listed, but Facebook Live Messenger and Messenger have the best reputations for seamless interaction with Facebook. Messenger Plus! Live has loads of customising options. There are skins, tools and you can even merge all your different email addresses so Live Messenger can notify you whenever you receive any emails. With the Windows Live Messenger Quote plugin you can insert any part of your Windows Live Messenger history into your blog post. MessengerDiscovery Live 1.5 has a wealth of customising tools and gives you the options of using your webcam to record and take photos. Check out the full list of 10 things you didn't know Windows Live Messenger could do.